CCS takes part in Culture Night in Cashel. 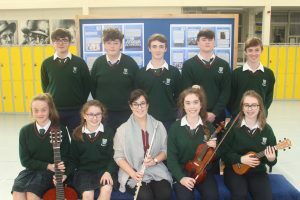 A musical group from Cashel Community School took part in a musical activity to highlight and showcase Culture Night as part of Cashel Arts Festival. Cashel Arts Festival presented this event to unite people by the magical power of music, from classical to contemporary. It supports local young performers who play musical instruments and would like to share their wonderful gift with other people. Back Row (Left to Right): Donnacha O’Dwyer, Richie Crowe, Stephen Foley, Adam Skeffington & Eoin Foley. Front Row (Left to Right): Sophie Rea, Áine Hanley, Ms. Liane Bradley (Music Teacher), Aoife Linehan & Saoirse Browne.